This may not last more than another minute, but if you want a Galaxy Note 4, you should head over to Amazon which has a lightning deal currently running that slashes the price to $620, off-contract, unlocked, for AT&T. The black version was available for all of 5 minutes before selling out. The white is still available for now. 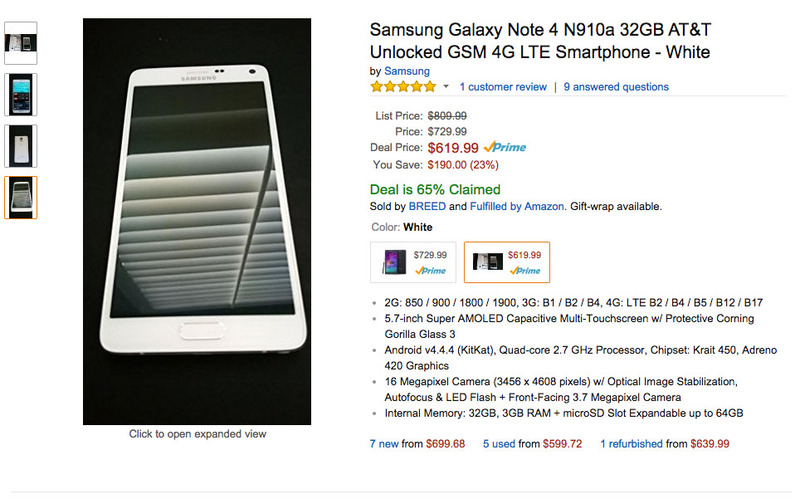 If that link isn’t working, go to the Amazon Deals page, scroll over in the lightning section until you see the Note 4. Note: The deal doesn’t mention the condition of the phone from what I can tell, and the pictures are a little off-putting. I would assume that the device is new, but can’t say for sure.